Destroy target permanent an opponent controls. 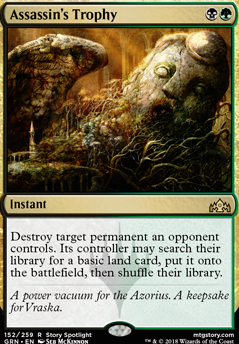 Its controller may search their library for basic land card, put it onto the battlefield, then shuffle their library. Hey Spirits, so yeah all the combos you mentioned that I have I took directly from your decktech. I simply cannot do some of your super fast combos so I looked at your alternate combos section and essentially went for the ones that have a lot of the same cards involved such as: Kiki-Jiki, Mirror Breaker , Adarkar Valkyrie , and Goblin Bombardment and sort of just ran with those. So the reason why I like Mark of Fury is because of its reusability. 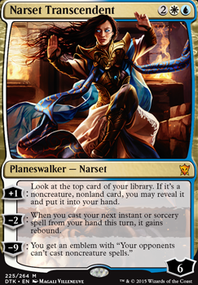 I believe one of my buddies in my playgroup uses 1 or 2 ( Anguished Unmaking & Assassin's Trophy ) cards for instant speed, target permanent removal so I think it being in danger until EOT isn't too bad, and with Grand Abolisher out, its totally safe. I use Reliquary Tower just in case I find myself with a boat load of cards and not wanting to discard them; but perhaps I will consider cutting it. 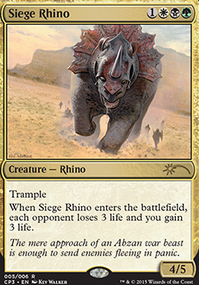 Terramorphic Expanse and Evolving Wilds are the same card with different names. I only run 1 just to be certain that at least by the 2nd turn I should have most of my colors. 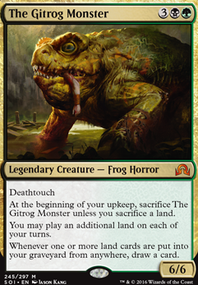 I have 1 of the fetches in there ( Bloodstained Mire , but Arid Mesa and Marsh Flats are just outa my magic budget at the moment. Crucible of Worlds + fetch or Strip Mine is BRILLIANT. never thought of that. While its a bit pricey it's not too bad... might pick one of those up. Your right about Reflecting Pool , honestly should pick one of those up before they go any higher. 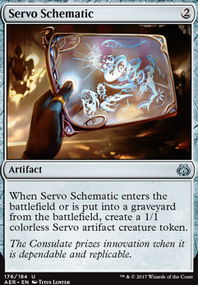 I do wanna wait to see what gets reprinted in Modern Horizons before I make any big purchases though. And yeah Leyline of the Void is great... but WAY to pricey for me right now lol. And yes... Angel of Jubilation scares me. I think I may play test her a couple of times and see if i can balance and control when she is on the field and when I need to do the things she won't allow. and I believe your right with how it works. it WOULD shut of things like fetches, Necropotence , and Phyrexian Reclamation . but yeah I think shocklands are fine because it is part of it resolving, not an activation cost. Yes Angel of Despair is better but not against a recursion deck like Meren of Clan Nel Toth . Essentially I need to prevent him from sacking his stuff to make us sack ours; or exile it once the threat has entered the battlefield so it STAYS GONE. going to the graveyard is just not good enough.... Honestly, it's kind of why i Wanna Lord of the Void . Because not only do i get to take some of his stuff, but I'm also exiling his stuff in the process. Mother of Runes IS great, I considered her for a moment. But much of what I'm up against is untargetted removal. where IIIIII am being forced to sack MY permanents or the board is being wiped. it's brutal lol. So i ended up cutting her. Hall of the Bandit Lord is on my "to buy" list but... too $$$. I was 50/50 on Rakdos the Defiler . It seems decent but if im in for the long haul for the game, I dont wanna be sacking my angels and dragons cuz of him. Zealous Conscripts are right on the cusp of staying in. I just need to figure out what to cut. Woops, bad link: Whirly Chain Gang. 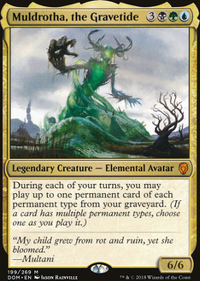 I don't think Find / Finality is that hard to cast, as we're already playing 5-drops in Skarrgan Hellkite . Worst case scenario it gets back hasty creatures or even better, it pulls up Goblin Chainwhirler for later use of Status / Statue . I do like things a bit more midrange-y, but at least the black splash feels quite safe. Oakenform serves no purpose. Sanguine Bond would streamline the decks strategy. Windgrace's Judgement, Maelstrom Pulse , Abrupt Decay and/or Assassin's Trophy are the best removal spells in Golgari and worthy of a spot in this list. This was so needed card:Despark that card is a slightly less powerful Assassin's Trophy but yet again black is required; I was hoping red would get something like Bombard for planeswalkers or Fight with Fire that targets planeswalkers. 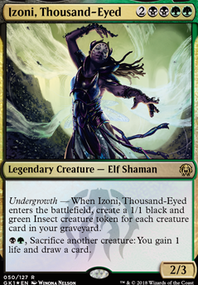 I am not even running any these cards in my decks I was just hoping for a more diverse set of tools to deal with the upcoming onslaught of planeswalkers to have a more diverse deck builds. Personally on arena I am already dipped into black on one of my main decks so very little effect on me. Like I said I was just looking for a more diverse tool box to be created by MTG.